Spectrum cleaning professionals are trained to safely and properly clean and remove odors from the various types of fabrics used on upholstery, including leather cleaning and microfiber cleaning. Office chairs, sofas, loveseats, sectional couches, dining room chairs – no matter what kind of furniture cleaning you need – we can clean it. This is one of the most important part of the cleaning process. Pre-vacuum all surfaces to be cleaned using CRI certified commercial-grade canister vacuums equipped with HEPA filters. 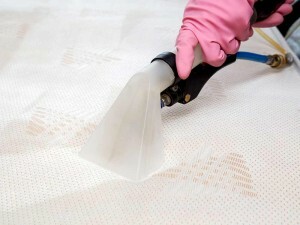 This prepares the upholstery fabric for preconditioning and hot water extraction cleaning. Application of pre-conditioner spray to break down down soiling or sticky substances left behind by spills, food, body oils, etc. Agitate soiled areas with a small upholstery rake or brush. This helps increase the effectiveness of the pre-conditioner that has been applied. Clean the upholstery using a hot water extraction system (either a truckmount or a portable cleaning system). Some fabrics require cold water, in those cases heat is not utilized. We use special upholstery tools to ensure the appropriate volume of water is utilized. A rinsing agent is also used in the cleaning process to make sure the pH balance of the fabric is returned to neutral. Hot water extraction cleaning removes the original protector (i.e. Scotchgard) from the fabric, therefore it is highly recommended to reapply protector after cleaning. This helps the fabrics to be much more resistant to spills or stains, and easier to clean in the future. Periodically we use a special brush to “groom” the upholstery. This helps to evenly work in the fabric protector while evening out the fibers so that the overall appearance is consistent. Final walkthrough of cleaned upholstery items to ensure the client is pleased with the outcome. Contact your Aurora upholstery cleaners today at (630) 898-3200. See what some of our clients have said about our great team!